Blade Server is an server architecture that integrates card like modules consisting of all the elements of a server. Here are details on what is Blade Server. These cards are called blades, which are inserted into the backplane in a chassis that in turn is part and to share common elements such as ventilation, network switches etc. While a rack server is slightly reduced in size, the blade server is much more compact, because several components are removed, being shared in a chassis which can accommodate multiple blade servers. Blade card is a full server. The RAM, hard disk, CPU, are contained in the Blade, these are installed by simply inserting in to the Blade Server. The trays of the Blade Server can be removed when desired and similarly, the Blade Server does not suffer any modifications and always remaining full capacity. The main difference with a rack mounted system is, the server is a complete unit in itself in case of rack server. This means that it contains the CPU, memory, power supplies, fans and heat sinks. These servers are screwed into the rack and each server is connected to the corporate network using a separate cable. In contrast, blade server is a compact version of rack-mounted systems. The blade of any Blade Server includes a CPU, memory and data storage devices. But it has no power supply or fans. The blades are inserted into slots and linked together by a high-speed bus in the chassis. BladeCenter or Blade Enclosure for these Blade Server are usually for the 19-inch racks. 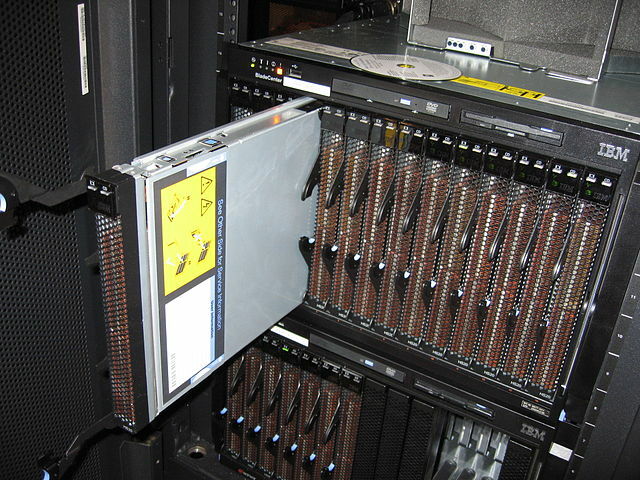 The blades are inserted into slot and are then attached with the backplane connected to the rack. So the whole ‘box’ is blade server, while one unit is a blade. The source of photo : Flicker, by Jemimus. It is licensed under Creative Commons Share Alike. The main advantage of blade server is a cost of acquisition and operation is less than traditional servers. Also the hassle of cables is less in blade server. Blade Server take up less space, because it is possible to locate sixteen (16) servers within one rack. Blade server is claimed to be less prone to failure because each server blade contains no mechanical elements. Over heating is a serious issue in blade server due to the pattern has to be same usage under ideal condition. This Article Has Been Shared 5520 Times! Personal Computer Hardware or PC Hardware builds up a cheap day to used kind of microcomputers. PC Hardware refers to all tangible parts of a Personal Computer. Cite this article as: Abhishek Ghosh, "Blade Server : What is Blade Server," in The Customize Windows, January 23, 2012, April 25, 2019, https://thecustomizewindows.com/2012/01/blade-server-what-is-blade-server/.